Welcome to the Railway History Page! 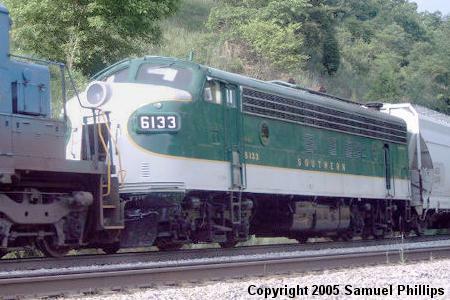 I hope you enjoy the progress as I continue to add information to this page on the history of the Southern Railway Corporation, Norfolk Southern Railway Corporation, Kansas City Southern Railway, and Amtrak. 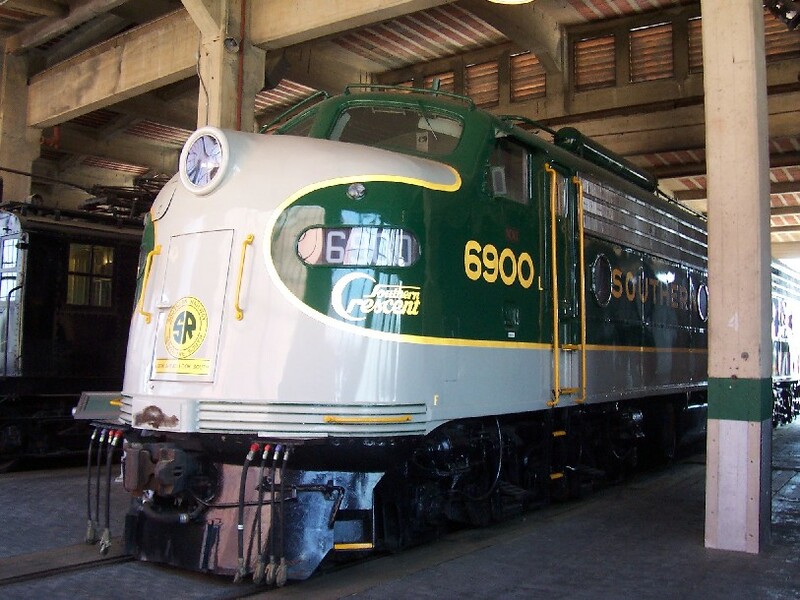 Southern Railway #6900 now sits in the Robert Julian Roundhouse at the North Carolina Transportation Museum. This image was taken on the afternoon of Sunday, May 20th during a family outing. This image was taken on our way back from a short vacation in the Smoky Mountains in Tennessee and western North Carolina. I convinced the family that the short 30 minute drive and diversion from Interstate 40 would get us a few hours of visiting a really neat museum. And boy was I delighted! As we entered the Barber Junction depot information station of the NCTHC to buy our tickets for the short train ride I noticed a small sign next to the register advertising cab rides for $10.00 per person. Now my excitement level jumped about tenfold! After purchasing the three tickets we waited about 25 minutes and then were able to climb up and into the cab of the Southern #6133 FP-7 locomotive. Monique and Ben sat in the extra seats and I stood up for the enjoyable 25 minute ride through the grounds with Paul the Engineer. The grounds cover approximately 44 acres of the original site and both ends of the yard tracks are still connected to the Norfolk Southern line between Salisbury and Spencer, NC. NOTE: The following is reproduced from the Southern Railway promotional booklet publication: The Southern Crescent - A History of Good Service. Date, location, and copyright of this publication is not documented. In an effort to preserve the history and heritage of the Southern Railway publications this author is seeking any rights to make available an electronic version (pdf or jpg) of this publication. Bolded sections are accompanied by illustrations or images in the original document, and these are pending at this time. Locomotives powering the "Southern Crescent" once again wear Southern's green and gold, with a distinctive monogram identifying the railway's finest passenger train. When Southern recently completed repainting the diesel units assigned to the "Southern Crescent" and emblazoning the train's name on gold across the noses of the diesels, the railway was recognizing a tradition of luxury passenger travel that's almost a century old. A decade after the Civil War, Southern's predecessor, the Richmond and Danville Railroad Company, established the "Piedmont Air Line Route." 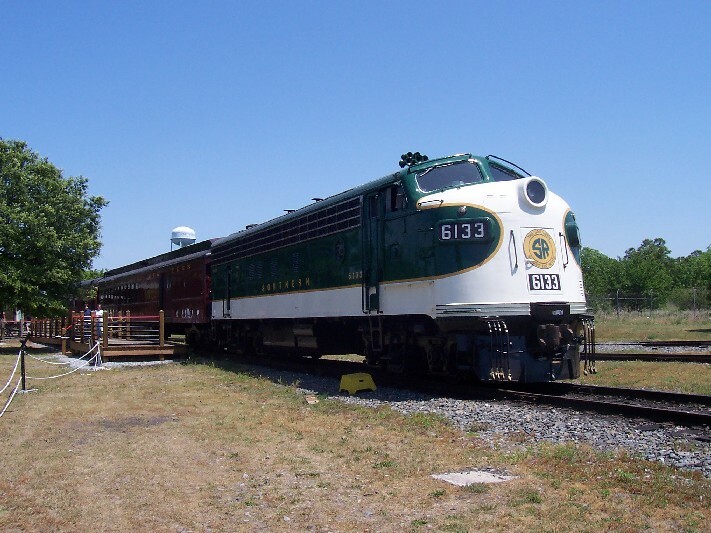 This connected the Northeast with Atlanta and New Orleans both via Richmond and via Southern's present route through Charlottesville, VA., and Lynchburg, VA. The "Southern Express" and the "Southern Mail" operated over these routes, on an advertised time of 57 hours and 40 minutes, including a change at Atlanta. Today's "Southern Crescent is the lineal descendant of the "Washington and Southwestern Vestibuled Limited," inaugurated in January, 1891, by the Richmond and Danville Railroad along the "Piedmont Air Line Route." This Washington-Atlanta train was soon nicknamed the "Vestibule" because it was the first all-year train with vestibuled equipment operating in the South. The observation car of the 1891 "Washington and Southwestern Vestibule Limited" was "fitted with luxurious easy chairs; a selected library of fiction, adventure and travel; writing conveniences and a buffet." The brochure announcing the train hailed it as "a service second to none in completeness and elegance of detail providing all the latest and best facilities for the comfort and enjoyment of its patrons." And the "Vestibule" lived up to its billing. Drawing room and stateroom sleeping cars, dining cars, smoking and library cars, and observation cars embodied the latest, most luxurious designs. They were gas lighted throughout and equipped with hot and cold running water. The vestibuled platforms proved an interesting novelty. Many passengers spent considerable time walking from one car to another just to enjoy the unusual experience of being able to do so without having their hats blown away. Soon the Washington-Atlanta schedule expanded to include a through Pullman to New Orleans via Montgomery and Mobile, AL., over the rails of the Atlanta and West Point, the Western Railway of Alabama, and the Louisville and Nashville Railroad. New York was brought into the schedule, via a connection with the Pennsylvania Railroad's "Congressional Limited." Scheduled time for the New York-New Orleans run was advertised as a "40-hour, unprecedented" trip. Because of the popularity of this through service, the "Washington and Southwestern Vestibuled Limited" became a solid train of through cars between New York and New Orleans. It carried the first dining cars to operate between those two cities. "Courtier," one of three identical "Vestibule-library and observation" cars built in 1890. Car contained 10 sections and a lounge. "Saxonia" operated in the consist of the "Palm Limited" which ran between New York and Aiken, S. C. It had eight sections, one drawing room and three staterooms. No. 1454, built in 1910 for service on "New York, Atlanta and New Orleans Limited" was an elegant example of a wooden club car. Coach 1397, a typical example of equipment that operated for short periods on otherwise all-Pullman train. This one was delivered by Pullman in October 1909. Operation of the "Vestibule" continued after Southern Railway Company was incorporated in 1984 by the purchasers of the Richmond and Danville. When vestibules became commonplace on long distance trains, the title was shortened to "Washington and Southwestern Limited." After 1900, through sleeping cars (for Tampa, FL, and Nashville, TN) were added and, for the first time in its history, the "Limited" carried coaches between New York and Atlanta. After operating 15 years as a solid train, in 1906 the train was renamed the "New York and New Orleans Limited" and re-equipped with new observation and club cars. It became "a year-around exclusive Pullman car train." Coast-to-coast passengers (in connection with the Southern Pacific "Sunset Limited Express" via New Orleans) were actively solicited. A new service was begun in 1925 and the train was renamed the "Crescent Limited." On April 26, with the clock of the St. Louis Cathedral, New Orleans striking 10 p.m., a graceful Louisville and Nashville Pacific Class K-2, of pre-World War I vintage, pulled out of Canal Street station on her maiden trip to New York City. This new deluxe, extra-fare all-Pullman consist ran solidly between New Orleans and New York over the L&N, the West Point Route, the Southern and Pennsylvania railroads. The "Crescent Limited" had luxurious Pullman equipment of the latest design, arranged to provide optimum comfort and convenience. The club car was forward with movable easy chairs. Passengers lounged, smoked and chatted, with a valet-porter always nearby to assure comfort. Electric lighting was praised with the enthusiasm a later generation of travelers would heap upon air conditioning. The observation car served as a salon for social gatherings. There was the usual large smoking room for the men and spacious dressing rooms for ladies and children. After July of 1926, the "Crescent Limited" was pulled between Atlanta and Washington by Southern's new green and gold heavy Pacific locomotives, each decorated with a gold crescent on the cylinder and the train's name emblazoned on the tender. Locomotive fanciers agree that those handsome iron horses rank among the most beautiful of all time. Handsome electrically illuminated tail signs were installed on the train's new observation sleepers. Rectangular in shape, the signs had a dark blue background, showing a field lf stars and the name "Crescent Limited" in white. Map showing the route of the "Crescent Limited" of 1925. Apparently the train followed a gradeless route. Advertising fanfare accompanied the debut of the new "Crescent Limited" April 26, 1925. "Crescent Limited" of 1929, near Easley, S. C., behind Ps-4-1394 in famed timetable cover photo. Ladies Maid was feature of new train. The idea of painting Southern locomotives a beautiful green with gleaming gold accents did not come from an advertising man. It came from Fairfax Harrison, president of Southern at the time. During a visit to England, he was favorably impressed by the popularity and beauty of green as a locomotive color. He particularly admired the medium shade of green sued on the Southern (of England) and the lighter apple green of the London and North Eastern. Southern Railway announced in 1929 that its first "train of luxury" was to begin life anew with brand-new equipment. Along with new Pullmans, cars built especially for the "Crescent Limited" four years earlier were completely refinished. What was "all new" was the distinctive exterior finish. Two shades of green adorned the luxury cars, each one lettered "Crescent Limited" in gold leaf along the upper panels. Pullman cars were named for distinguished sons of the seven states of the South through which the train ran. During the Great Depression, the name "Crescent Limited" along with the extra fare and apple green color train vanished from the timetable. Southern Railway thought it best to "soft-pedal" its luxurious headliner during those severe times. In 1934 the name "Crescent Limited" was officially discontinued. An Associated Press dispatch written by Dillon Graham of New Orleans amply summed up the sentiments surrounding the last trip. Mr. Graham said: "The 'Crescent Limited,' crack green-coach passenger train that for years has raced through the South on its flight from Broadway to Noo A'Leens, makes its last run Wednesday choosing retirement rather than the commonness of carrying day coaches as just another transport. "Never has this last of the extra-fare trains of Dixie linked a day coach to its string of all-Pullman cars. For years reservations on this deluxe liner of the rails were almost at a premium. Patronage has fallen off in recent years and this has forced the removal of the extra fare and the addition of day coaches. "Within every railroader there is sentiment and romance attached to trains. With the 'Crescent's proud history, it would have been less majestic to ask her to take to the roadbeds as just another train and not the accepted queen of the line. So the fast limited, with its famed identifying green-colored cars is being honorably withdrawn from service." The former "Crescent Limited" became known as "Nos. 37 and 38," and coaches were added to the consist. But in 1938 the train was renamed the "Crescent" and air-conditioned coach equipment, the first on the Southern, was added. The coaches to the former Nos. 37 and 38 were removed to once again make the train all Pullman.th of Montgomery, AL, in 1941, the "Crescent Limited" covers ground behind the tank of light U.S.R.A. Mountain-type 412 of the Louisville and Nashville.